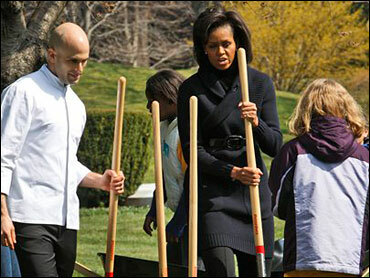 Michelle Obama planted a garden at the White House. It is an act fraught with meaning and symbolism. Some of it is the idea of slow foods, of eating fresh. It's modern. Most of it though is old-school. It represents some of what we think to be part of our national DNA. Like the idea of getting your hands dirty. Part of the mythology of America is that everyone can succeed in this country. All that's required is ambition and hard work, gardens require hard work. If you want your beans and tomatoes to come up just right, you've got to get on your hands and knees and pull weeds. Mrs. Obama has promised her kids will learn how to do it. And that too is symbolic. That the most privileged kids in country will have to do something that is decidedly unglamorous. I grew up working on vegetable farms and being able to fill a lunch bucket with fresh green beans to bring home at night was a wonderful fringe benefit. Understanding the labor required was a lesson I'll never forget.